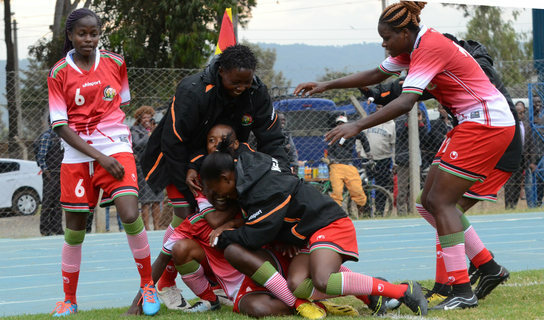 National women football team Harambee Starlets edged closer to qualifying for the African Women’s Cup of Nations in Ghana with a 2-1 win over Equatorial Guinea in the first leg of their ultimate qualifier at the Kenyatta Stadium in Machakos on Wednesday. Esse Akida stepped off the bench to score the winner in the 84th minute as the team came from a goal down to win. Teresa Engesha’s audacious strike cancelled out Jade Boho Sayo’s goal just two minutes after she headed the visitors ahead. Starlets pushed on by a sizeable crowd threatened from the first minute when Neddy Atieno was picked out by a cross from Mwanahalima Adam but the forward took a heavy first touch allowing the keeper to come off her line and collect. The visitors had the first chance in the 21st minute when Boho who had been a danger all through the opening minutes found some shooting space but her effort went straight to keeper Poline Atieno. The visitors came very close once again when Gloria Chinasa’s diving header from a Dorine Nina freekick went just wide. The West Africans finally broke the deadlock in the 38th minute when Boho sneaked in behind the Kenyan defence to head home from a Genoveva Anonman corner. But, no sooner had the high fives and celebrations cooled off than Kenya went back into the game. Engesha struck a beauty of a shot from range which found the keeper napping. Starlets started the second half with the same momentum and four minutes in Dorcas Shikobe had a shot after Mwanahalima’s corner was tapped down by Cheris Avilia, but the central defender’s shot was wide. Coach David Ouma made his first change pulling off Sheryl Angachi for Esse Akida in a bid to add some spice into attack. Akida got into the mix immediately in the 58th minute lifting a cross to Mwanahalima’s path bit the pint-sized assassin struck her volley wide. On the other end, Kenyan keeper Poline Atieno made a brilliant save to tip over a header from Chinasa who had gone high unmarked from another of Anonman’s deliveries. Ouma decided to go all out attack, pulling out Neddy Atieno and goal scorer Engesha for Mercy Achieng and Cynthia Shilwatso. The pressure brought in by a fresh attack line bore fruit six minutes from time when Shilwatso raced away on the left before cutting back a cross that was tapped home by Akida.